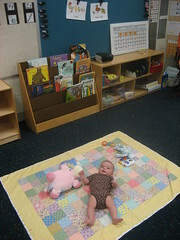 Last week Sophie got her first taste of school while I helped my mom set up her kindergarten classroom. She played with her toys while I worked on the calendar, sat on my lap while I organized crayons and tried to eat the smelly stickers. 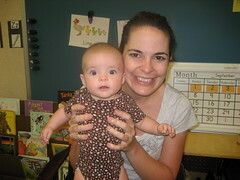 She was a huge hit in the front office (I think Nini enjoyed showing her off). After setting up the room we met Grandpa for lunch at The Original Pancake House (yum). This entry was written by kara, posted on August 25, 2008 at 9:52 pm, filed under Uncategorized. Bookmark the permalink. Follow any comments here with the RSS feed for this post. Post a comment or leave a trackback: Trackback URL.